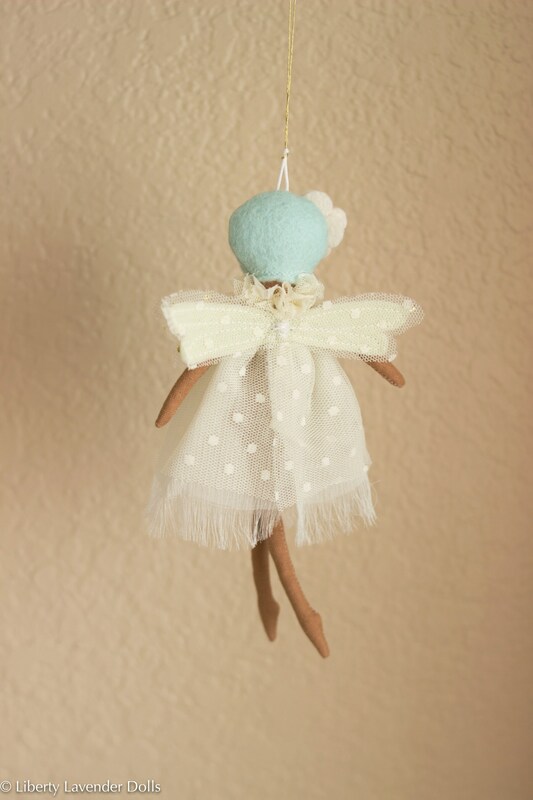 Tiny Wisp Fairy Doll, Decorative Mini Wall Hanging Art Doll Ornament , 6.5 ish tall. 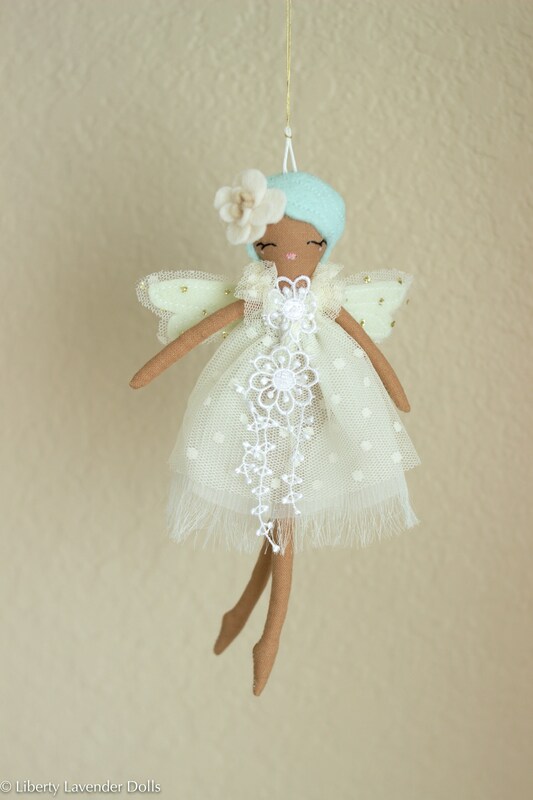 Tiny Wisp Fairy Doll, Decorative Mini Wall Hanging Art Doll Ornament , 6.5" ish tall. Beautiful tiny cloth doll. Her face is embroidered and painted by hand and her clothing is sewn on. She has a loop of cord attached to her head for easy hanging on the wall. ♥ Her face is hand embroidered and painted with non toxic fabric ink. ♥ Doll measures approximately 6.5 to 7 inches tall , from toes to top of head. ♥ Fabric body is cotton. Felt is merino wool. Clothing fibers vary. Stuffed with polyester fiber. All new materials. ♥ None of my dolls are completely identical. They are always unique and have some flaws due to being handmade. ♥ Not for use by children 3 and under, has small parts and/or long strings. These can be hazardous to infants and small children. 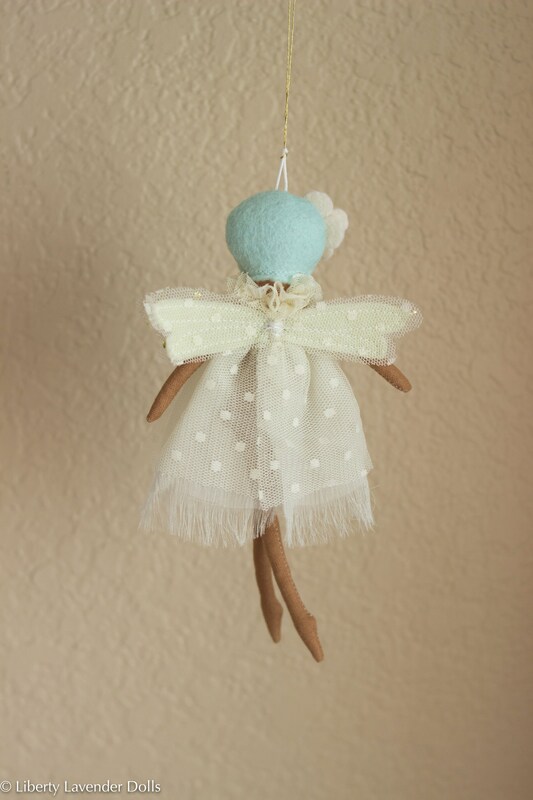 This doll is meant for decorative purposes, please hang it out of reach of small children. When necessary: Spot clean gently only with cold water, no bleach or harsh detergents, lay flat to dry. Do not iron. Please do not brush any hair or mess with it too much. May get damaged if left in direct sunlight or harsh conditions. Please do not copy any of my work. Colors may display differently on different screens, although I have done my best to accurately depict the item. Please see shop policies before buying, sale is final. I take Paypal and Etsy's Direct Checkout. I reserve the right to cancel orders for any reason. Ready-to-ship dolls generally given to the postal service within 1-3 business days (or less) but please look at the listing or your order for exact processing times. I ship first class via USPS most of the time, please let me know if you'd rather use another shipping method prior to ordering. Made to order items are shipped as soon as possible, after I finish making them. How much time it takes to make an item depends on what it is and how many orders I currently have to work on. International purchases may incur additional fees and/or taxes in the destination country. These are the responsibility of the buyer. International packages will be shipped first class international service unless there is a reason that cannot happen or if you purchase a shipping upgrade. International packages cannot be tracked accurately unless you ship priority mail or some other form of upgraded shipping. If there is an issue with your purchase please contact me and I will do my best to find a solution to make you happy, however I do not give refunds. I do not take cancellations on orders placed in my etsy shop. If your package is lost or damaged please contact me. Please contact my with any other questions! Carefully and gently spot clean with cold water if necessary, air dry. Our products are not meant for under 3 years of age. They contain small parts and have strings that could pose a safety risk for small children. Always supervise young children when playing with any dolls. Keep out of reach of babies.